We’ve received several requests for recipes that have been referenced in recent posts on the deluded diva. Believe me when I say there is nothing deluded about these fabulous Christmas snacks which are both from the all important chocolate food group. The only thing deluded about these recipes would be denial that they won’t pack on the pounds if you overindulge! Mix all ingredients together except the chocolate chips or chocolate bark. Shape the mixture into balls. It is good to dust your hands with part of another box of powdered sugar when making the balls. This helps keep the mixture from sticking to your hands. 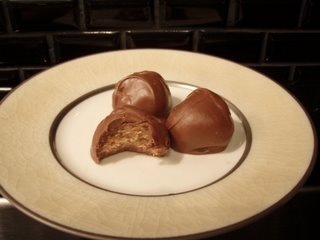 Melt the chips or bark and dip the balls into the chocolate. After dipping in chocolate, place the balls on wax paper to firm up. 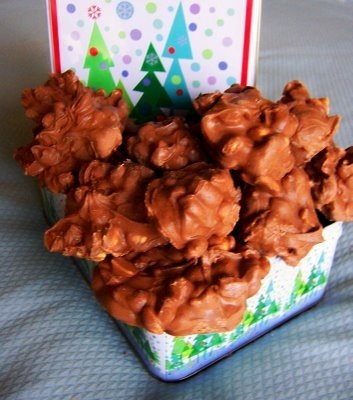 f you are looking for an easy homemade gift for family and friends this is it. It is so easy to make, but you can honestly tell them it took hours of hard work in the kitchen!! It cooks in the crock pot while you are doing something else! Layer ingredients in large round crockpot in order given. Do not mix or stir. Heat on low for two hours. Do not lift lid. After two hours, stir well and drop by teaspoons onto waxed paper. She used Reynolds Release (whatever that is) instead. Let cool until firm before removing. This entry was posted in Food & Entertainment and tagged crock pot candy, Dreaming of a chocolate Christmas, Food gifts for Xmas by Emily Jones. Bookmark the permalink. Norma’s Chocolate Balls recipe is the same as my mother’s recipe for Chocolate Logs. Mama’s suggests forming the ingredients into two-inch logs before dipping in the chocolate, hence the name. She thinks it is ridiculous that I make mine into balls and get about 90 pieces of candy when the recipe plainly says to make it into LOGS! I have to say, the taste is right up there with a Snickers. And that Crockpot Candy is to die for. Here it is 11:55 p.m., and I’m drooling on the computer. Better hit the hay.